Bentley, the global leader of comprehensive software solutions is on a mission is to provide innovative applications and services, while advancing both the global economy and the environment for improved quality of life. Working with an objective to Accelerate Digital Engineering, Clove Tech leaves no stone unturned while taking advantage of the best-in- class platforms such as Bentley Systems. 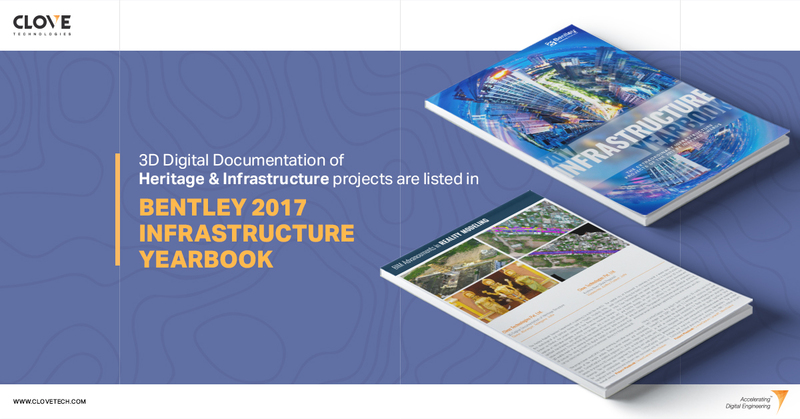 It is delightful to see our projects being listed in ‘The 2017 Infrastructure Yearbook’ of Bentley. 3D BIM Modeling for Nagpur Metro (Nagpur, Maharashtra) is published under BIM Advancements in RAIL AND TRANSIT while 3D Digital Documentation of Heritage Structure (Thorur, Warangal) and Krishna River Walk Proposal (Vijayawada) are listed under BIM Advancements in REALITY MODELING. We are happy to receive the Certificate of Achievement for one of our prestigious projects, ‘Nagpur Metro’ during their ‘Be Inspired’ awards.